I have grown up with such strong love for the semolina that I can never get tired of eating it in any form. From sajjige (also known as ‘upma’) to sheera (also called as ‘rava halwa’ or ‘kesari baath’), I also enjoy it in porridges or dosas. I have quite a few recipes made using semolina and I will link all of them down below. 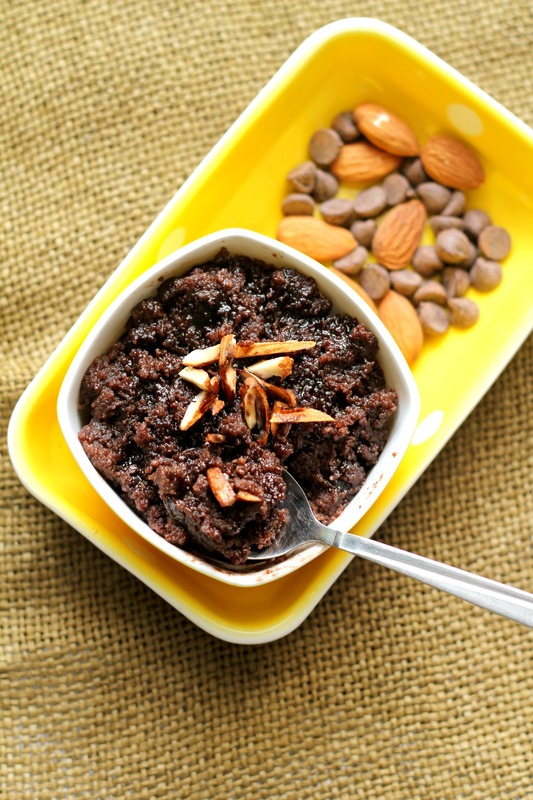 The latest addition to this repertoire is chocolate sheera, cuz why not? On days when I have a little free time after lunch, I try out something new and this recipe was the result of one such experiment. I had a little condensed milk leftover from another recipe and I had to put it to good use before it went bad. I also had to make something chocolatey to satisfy my own craving and something filling for my kids for their evening snack. I decided that I would try something easy to make, like the sheera of course and I am glad this it turned out pretty good. Want to try this recipe? Click the image below to save it on Pinterest! 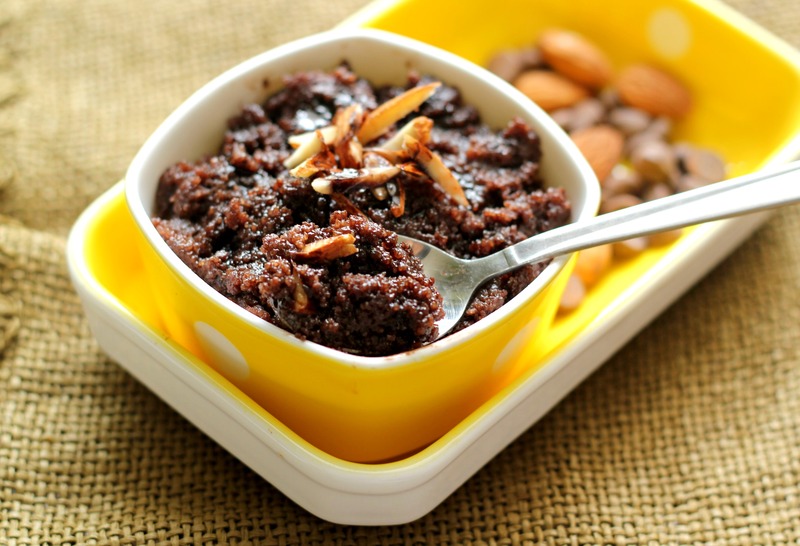 A super delicious variation of the regular sheera, especially for choco-holics! Add the condensed milk and the milk to a saucepan and bring the mixture to a boil. Reduce heat and add the unsweetened cocoa powder and whisk to remove any lumps. Turn off the heat and keep aside. In a heavy based kadai/pan, heat the ghee and roast the semolina on a very low heat for about 3-4 minutes. Take care to see that the semolina does not burn so keep an eye out. Add the freshly boiled milk mixture and whisk everything continuously to prevent lumps from forming. Cook the mixture on a low heat till it thickens. This will take a few minutes considering the ratio of semolina to liquid that we are using. You can add the slivered almonds now or use them only for garnishing. You can also add the chocolate chips at this stage unless you want to use them to garnish. When the sheera has thickened, turn off the heat and cover it for about a minute or two. 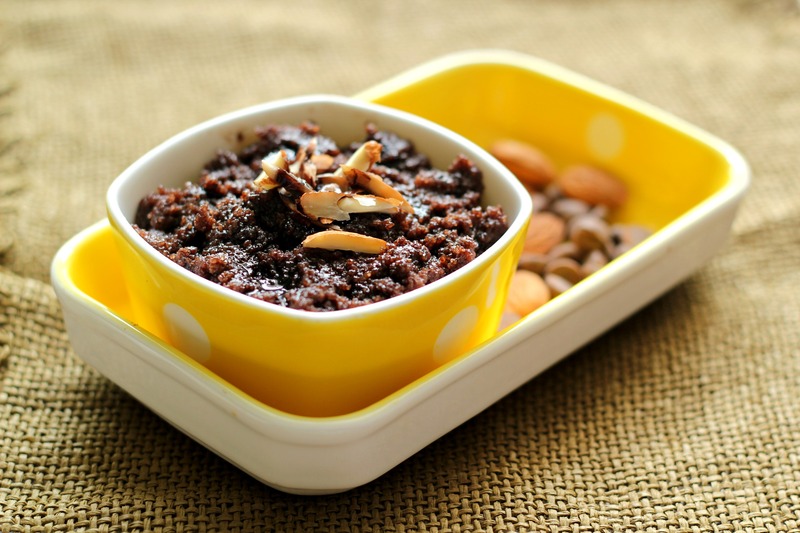 Serve hot garnished with chocolate chips and the slivered almonds. If you intend to add the chocolate chips to the sheera during the cooking stage then don't use more than 3/4th cup of condensed milk as it will make the sheera too sweet. I love anything rava as well. This sounds interesting. Have you tried rava with Jaggery instead of using the regular sugar, it’s one of my favourites. Thanks for your lovely comment Joanita! 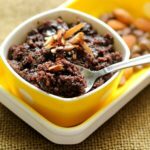 I hope you enjoy this recipe whenever you make it 🙂 Rava with jaggery sounds so yum! I will definitely give it a try soon!